Hi lovelies! 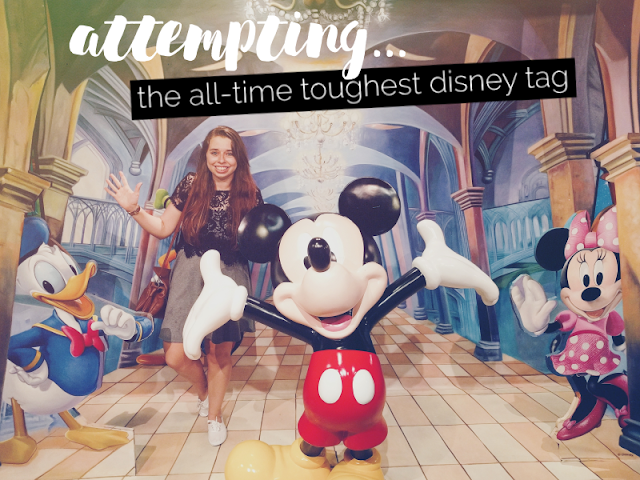 I was tagged by the lovely Victoria from Accio Victoria and Emma from Once Upon A Disney Blog to take part in the "All-Time Toughest Disney Tag Yet" and let me tell you, it really lives up to it's name! This tag was created by the gorgeous Mandy Jean World and you can see her original post on the tag here with all the rules on how to take part. Let's begin! 1. Who is your all-time favourite Disney animator, and why? Ashamedly, I don't know much about Disney animators at all but Glen Keane sticks out for me as he's worked on many Disney films that I love such as Tarzan, Aladdin and Tangled. The Renaissance without a doubt. I grew up with these movies and they've gone on to become some of my all-time favourite Disney films! 3. If Walt Disney were alive and you were allowed to ask him ONE question, but ONE question only, what would you ask him? What is your favourite Disney film that has been made since your death, and why? 4. Who is your all-time favourite Disney director, and why? John Lasseter, but not necessarily for his Disney directing, more his producing! While he's directed a few of my favourite Pixar films (e.g. Toy Story and A Bug's Life), he has produced a much longer list of amazing Disney/Pixar films, including The Princess and the Frog, Wreck-It Ralph, Monsters University, Frozen, Big Hero 6 and Moana. Even more than that, it was due to John Lasseter's friendship with Studio Ghibli's co-founder Hayao Miyazaki that Disney ended up having ties with the Studio in the first place and he also served as executive producer of the US versions of many of my favourite Studio Ghibli films as well! Basically John Lasseter has played a part in creating so many of my most beloved films! 5. What is your all-time favourite Disney song, and why? I actually did a post on my top ten favourite Disney songs last year and I chose I'll Make a Man Out of You from Mulan as the #1 song which is still true today! I don't think I'll ever get sick of that song, plus who doesn't love a good montage?! 6. If you were forced to erase ONE Disney movie from history, which would you pick, and why? John Carter. I tried so badly to like it but I just couldn't, sorry! 7. Which Disney Park from around the world is your all-time favourite, and what makes it stand out from the others to you? Hong Kong Disneyland! Partially because it's the first park I've been to that I can remember (I went to Disneyland Paris in my childhood but I was so little that I have next-to-no memories of the trip!) but also because it's such a magical, unique little resort. I mean... You can see mountains behind the castle! I know I'll love other resorts when I visit them but HKDL will always have a special place in my heart. 8. You have only 30 mins to spend in Disneyland before you're magically whisked back home by a portal. What do you do with that time? 9. You get to choose ONE Disney heroine to join the official line of Disney Princesses, Who do you choose and why? These questions are always a little confusing for me because I never know who to include in the line-up so I'm going to go off their current official one (Snow White, Cinderella, Aurora, Ariel, Belle, Jasmine, Pocahontas, Mulan, Tiana, Rapunzel & Merida). I'm sure they're probably adding her anyway, but I'd definitely choose Moana. She's such a great role model and it would be lovely if more people could see themselves represented in the Princess lineup! 10. Speaking of Disney Princesses... One will need to be demoted from the franchise to replace with the new heroine. Which existing princess would you remove from the franchise, and why? This is so difficult because I wouldn't want to remove any of them, but if I had to choose then it'd probably be Snow White. While I love her and she's obviously very important in Disney's history, her character is unfortunately a bit outdated now and I don't think as many children are able to relate to her compared to the other Princesses. 11. What is your all-time favourite under-rated Disney movie, and why? THE LONE RANGER. Oh my gosh. I feel like I could fangirl forever about this film yet nobody seems to know about it! It's a little uncomfortable for me to watch now as Johnny Depp stars in it (not to mention he also plays a Native American...) but it's such an epic, beautiful film that I can't stop loving it. I've linked the trailer here in case anyone want to find out more about it. 12. Which Disney villain do you feel is the most misunderstood and why? I have to admit that I barely ever feel sympathy for Disney's villians - they're so good at creating evil characters! But from the Star Wars world, I definitely think that Kylo Ren falls into this category. It's part of the reason that I like him so much - he seems very conflicted about which path he wants to choose, the light or the dark. I find him a much more interesting villain than ones that are completely evil! 13. You can only choose ONE Disney animal to be your pet. Who do you choose, and why? No contest - it would have to be Pascal! I'd love to take him everywhere on my shoulder with me as I feel like he'd have my back all the time and he's also totally add some much-needed sass to my day! 14. Who is the ONE Disney character you can relate to most, and why? I think it would have to be Mulan! I'm very clumsy like her and I'm always embarrassing myself in any and all situations! 15. Finally, the toughest question of all... What is your favourite Disney movie of all time, and why? I'm sure I'd give a different answer every time I'm asked this haha but based on how many times I've watched it, it's probably got to be Tangled! It's my go-to film when I need a little pick-me-up! Phew... That took me forever to do! I tag Jamie from Once Upon A Blog - good luck!